Shea butter – lavender is GMO free and has received the cruelty free PETA seal of approval. It is perfect for skin that is itchy, dry, irritated, sensitive, flaky and/or cracked. 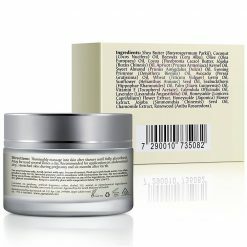 It is non-greasy and chalked full of vitamins, nourishing your skin and making it look silky and smooth. Shea butter – lavender effectively soothes, heals and repairs skin that is itchy, dry, irritated, sensitive, flaky and/or cracked. It is non-greasy and contains many vitamins, nourishing your skin and making it look silky smooth. It may also relieve symptoms of eczema, psoriasis, atopic and seborrheic dermatitis. Shea butter is suitable for both men and women and makes a perfect gift. 100% natural, paraben free herbal blend of shea butter, cocoa butter, coconut oil, olive oil, jojoba oil, beeswax, apricot kernel oil, sweet almond oil, evening primrose oil, avocado oil, wheat germ oil, sunflower seed oil, seabuckthorn oil, palm oil, vitamin E, calendula officinalis oil, honeysuckle flower extracts, jojoba seed oil, chamomile extract, rosewood and lavender oil. 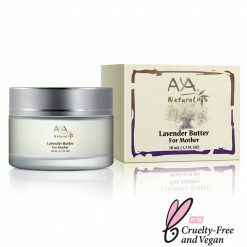 Shea butter – lavender has received the cruelty free PETA seal of approval and is free of any GMO.